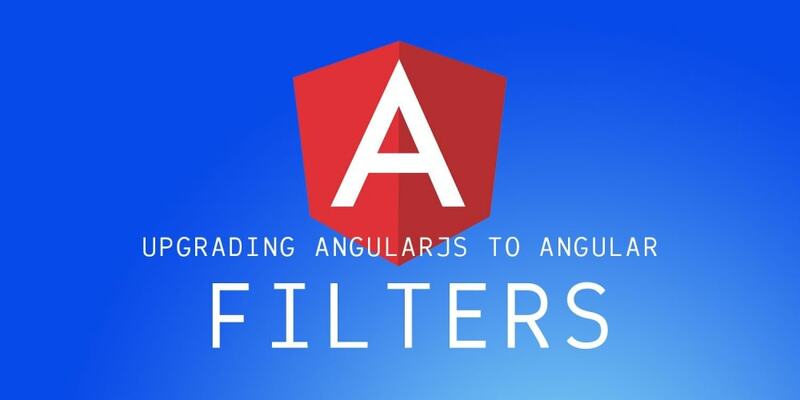 In the early days of AngularJS, one of the most celebrated features was the ability to filter and sort data on the page using only template variables and filters. The magic of two-way data binding won over many converts to AngularJS and helped it spread like wildfire. But how are we supposed to achieve that same effect? The answer lies in our components, so let&apos;s look at an ngUpgrade project and learn how to do this! We&apos;re going to step through updating the template of a freshly rewritten component. Then, we&apos;ll add sorting and filtering to restore all of the functionality it had in AngularJS. This is a key skill to develop for the ngUpgrade process. This sample project is an ngUpgrade hybrid project that uses both AngularJS 1.6 and Angular 4. It&apos;s got a working Express API and a Webpack builds for both development and production. Feel free to explore, fork it, and use the patterns in your own projects. If you&apos;d like to look at a version of this project that uses Angular 5, check out this repo. For the purposes of this tutorial, the differences between the two versions won&apos;t matter (I&apos;ll point out anything minor). At this stage in our application, our orders component is rewritten in Angular, with all of its dependencies injected and resolved. If we were to try to run our application, though, we&apos;d see errors in the console indicating problems with our template. That&apos;s what we need to fix first. We&apos;re going to replace the AngularJS syntax in the orders template (orders/orders.html) so we can get the route loading and the orders displayed on the page. We&apos;ll fix the filtering and sorting next. The first thing we need to do is get rid of all of the instances of $ctrl in this template. They&apos;re no longer necessary in Angular. We can just do a find and replace to find for $ctrl. (note the dot), and replace it with nothing. Now let&apos;s replace the data-ng-click in our button on line 13. In Angular, instead of ng-click, we just use the click event, with parentheses to indicate that it&apos;s an event. Brackets indicate an input, and parentheses indicate an output or an event. We&apos;re just saying here that on the click event, fire off the goToCreateOrder function on our orders component. You should see that our application is loading again. If you go to the orders route, you&apos;ll see that the orders component is displaying correctly. We can also click the Create Order button and it will send us correctly over to our Create Order route and form. Okay, let&apos;s get back to the HTML. Un-comment that div (our app will be broken again). Let&apos;s replace all of the rest of the instances data-ng-click with the (click) event handler. You can either use Find & Replace or just use your editor&apos;s shortcut for selecting all occurrences (in VS Code for Windows, this is Ctrl+Shift+L). Next, replace all of the occurrences of data-ng-show with *ngIf. There&apos;s actually no direct equivalent to ng-show in Angular, but that&apos;s okay. It&apos;s preferable to use *ngIf, because that way you&apos;re actually adding and removing elements from the DOM instead of just hiding and showing them. So, all we need to do is find our data-ng-shows and replace with *ngIf. Second, we can delete the data-ng prefix before the href link to the order detail route. AngularJS is still handling the routing here, but we don&apos;t need to use that prefix anymore since this is now an Angular template. There are a couple things wrong with it, of course. The sorting links no longer work, and now our currency is kind of messed up because the currency pipe in Angular is slightly different than its AngularJS counterpart. We&apos;ll get to that. For now, this is a great sign, because it means that our data is getting to the component and loading on the page. So, we&apos;ve got the basics of this template converted to Angular. Now we&apos;re ready to tackle our sorting and filtering! We already removed the orderBy filter from ng-repeat when we changed it to *ngFor. Now we&apos;re going to make a sorting function on the orders component. We can use the click events on our table headers to call that function and pass in the property that we want to sort by. We&apos;re also going to have that function toggle back and forth between ascending and descending. This dynamic sort function will compare the property value of objects in an array. The nested ternary function can be a little bit tricky to understand at first glance, but it&apos;s basically just saying that if the value of our property of A is less than B, return -1. Otherwise, if it&apos;s greater, return 1. If the two are equal, return 0. Now, this isn&apos;t super sophisticated or deep comparison. There are way more sophisticated helper functions you could write to sort for you, and feel free to experiment with how you can break this one. It will do for our purposes, though, and you can just swap out this logic with whatever custom sorting logic you like. And there&apos;s one last thing we need to do. We need to modify our dynamicSort function just a little bit to be able to reverse the order of the array for ascending or descending. To do this, we&apos;ll tie the result of the dynamicSort to the sortReverse property on the class. We&apos;re tying our functions together like this because we&apos;re only doing a simple toggle in our sort function for the sake of simplicity. To be more thorough, another approach would be to have a variable called sortDescending instead of sortReverse that&apos;s controlled through a separate function. If you go this route, you&apos;ll do the opposite -- sortOrder would be 1 unless sortDescending was true. Again, this is a simple implementation of sorting, but I want to be sure you understand the key concepts of using a custom sorting function on your component. So far, we&apos;ve added a dynamicSort helper function and a sortOrders function to our class so that we can sort on our component instead of on our template. To see if these functions are working, let&apos;s add a default sorting to our ngOnInit function. When the screen refreshes, you should see that the orders are being sorted by the total items (yay!). Now we just need to implement this sorting on our template by calling the sortOrders function in the from the table header links. We&apos;ve got our sortOrders function working correctly on our orders component, which means we&apos;re now ready to add it to our template so that the table headers are clickable again. That&apos;s a little bit more normal than using the total items. Now we can work on our template. The first thing we want to do is call the sortOrders function in all of our click events. You can select the instances of sortType = and replace them with sortOrders(. Then, you can replace the instances of ; sortReverse = !sortReverse with a simple ). We also need to fix two of the property names that we&apos;re passing in here, as well as in the *ngIf instances. Replace the 3 instances of orderId with id and the 3 instances of customername with customerName. Hop over to the browser and test out all of your table header links. You should see that each one of our properties now sorts, both in ascending and descending order. Awesome! This is great, but we did lose one thing - our cursor is a selector, not a pointer. Let&apos;s fix that with some CSS. We&apos;ve got our sorting working correctly on our orders page, but our cursor is now a selector instead of a pointer, and that&apos;s annoying. We could make a class in our main app SCSS file. We could write in-line CSS, although that&apos;s almost never preferable. We&apos;re going to go with the last option, because it&apos;s really simple and all we need to do is add one rule to our styles for this particular component. Now, when we hover over our row headers, you see we have the pointer cursor. What&apos;s cool about this approach is that this CSS rule won&apos;t affect any other components. It will just apply to our orders component! Now, let&apos;s see if we can do something about our filtering. That "filter filter" was removed from Angular, so we&apos;re going to have to be creative and come up with a way to implement it on our component. We&apos;re ready to replace our filter box that used to use the AngularJS filter to search through orders collection based on a string that we were searching. The AngularJS filter lived on our template and didn&apos;t require any code in our controller or component. Nowadays, that kind of logic in the template is discouraged. It&apos;s preferred to do that kind of sorting and filtering on our component class. Back in our component, we&apos;re going to make a new array of orders called filteredOrders. Then we&apos;re going to pass our orders array into a filter function that sets the filteredOrders array. Finally, we&apos;ll use the filteredOrders on our template in our *ngFor instead of our original array. That way we&apos;re not ever modifying the data that comes back from the server, we&apos;re just using a subset of it. Note that, in our if statement, we&apos;re explicitly testing for strings. In our example right now we&apos;re just going to limit our query to strings. We&apos;re not going to try to deal with nested properties, number properties, or anything like that. Our search term will match on our customer name property, and if we ever choose to display our address or any other string property it&apos;ll search through those as well. Of course, we could also modify this function to test for numbers, or look through another layer of nested objects, and that&apos;s totally up to you. Just like with our sorting, we&apos;re going to start with a simple implementation and let you use your imagination to make it more complex. Now we&apos;re ready to implement this filtering on the template. Let&apos;s move back to our template and fix it up to use our filtering. But what do we pass into the filter orders function? Well, by default, events pass something called $event. This contains something called a target, which then contains the value of the input. There&apos;s one problem with using $event. It&apos;s very difficult to keep track of those nebulous types because target.value could really be anything. This makes it tough to debug or know what type of value is expected. Instead, Angular has a really nifty thing we can do, which is to assign a template variable to this input. Luckily, Angular provides a really easy way to do this. After our input tag, we can add the hash sign (#) and then the name of our desired model. Let&apos;s call it #ordersFilter. It really doesn&apos;t matter where in the tag you put this or what you call it, but I like to put it after the input so that it&apos;s easy to catch which model is associated with which input if I just glance down the page. You can see how much cleaner our template is now that our filtering and sorting is in the component. Now let&apos;s check this out in the browser. If you enter some text in the box, like "sally," you should see that our orders are changing and that the sorting works on top of it: Awesome, we&apos;ve replaced another AngularJS feature! Now we&apos;ve just got one last thing we need to do on this component - fix the currency pipe. Our final touch is to update the former currency filter, which is now called the currency pipe in Angular. We just need to add a couple of paramters to the pipe in the template that we didn&apos;t have to specify in AngularJS. This part differs if you&apos;re using Angular 4 or Angular 5:. The first option is the currency code (there&apos;s lots, you&apos;re not limited to US dollars!). The second one is the symbol display. In Angular 4, this is a boolean that indicates whether to use the currency symbol or the code. In Angular 5+, the options are symbol, code, or symbol-narrow as strings. And we&apos;re done! To see the finished code, check out this commit. Wow! That&apos;s a lot - you should feel super proud! Change to a reactive approach. You could listen to an observable of value changes instead of the keyup function and do sorting and filtering in there. Using observables would also let you do really cool things like debounce the input! If you love this guide, I’ve got 200+ detailed videos, quiz questions, and more for you in my comprehensive course Upgrading AngularJS. I created it for everyday, normal developers and it’s the best ngUpgrade resource on the planet. Head on over and sign up for our email list to get yourself a free Upgrade Roadmap Checklist so you don’t lose track of your upgrade prep. And, while you’re there, check out our full demo. See you next time, Scotchers!